I mentioned yesterday that I had some worries about the Calmer I will be using for my T-Shirt. My first worry was that I wouldn't have enough usable yarn. 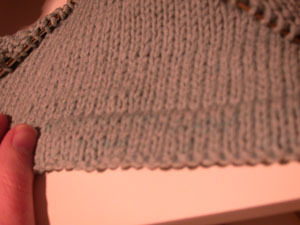 The top I knit with it last fall required several ripping and re-knitting sessions, so I had a ton of "yarn fragments". I cast on for the back and used up as many of the fragments as a I could to see how far they would get me. Fortunately, they went a lot further than I thought they would, so I think I'm in the clear. The second worry was the one I wanted to share with the blog world. When I recovered this yarn in February, I washed it as directed and hung it up to dry. Imagine my surprise -- and chagrin! -- when I discovered flecks of darker color on one section of some of the drying hanks. It was as if some of the dye ran down the hank and "pooled" at the bottom. It was not terribly dramatic, but it was definitely there. Here, I'll show you. I managed to use most of the yarn with the darker flecks before I did the hem, so look between the bottom of the garment and the hemline. I know it's not clear, but take my word for it: any variation you see there is the result of the bleeding color. I thought about swatching the two colors together and washing it to see if there was any color transfer. But I'm already concerned about not having enough of the main color to complete a project, and I don't want to lose more of it if the contrasting color does bleed. I know that Nona's T-Shirt knit-a-long doesn't start until tomorrow, but I'm curious -- has anybody else experimented with washing two Calmer colors together? If so, how did it come out? I don't know how this would work with handwashing, but what about getting some of those Shout dye-catching sheets? Thanks for your warning about the dye bleeding you're experiencing with the Calmer. I'll knit my swatch with both colors and then wash it to test the color fastness -- I'll keep you posted on the results. You've probably solved this problem already, but last night someone mentioned to me that during the Madras craze of the 1960s, one was advised to wash Madras in salt water to minimize, or eliminate color bleeding. Unfortunately, she couldn't remember the proportions of salt and water.